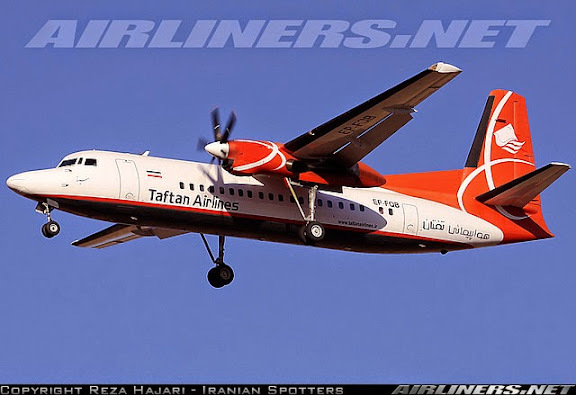 Taftan Air (SBT, Tehran Mehrabad) has resumed operations using four Fokker 50 aircraft leased from fellow Iranian operator, Qeshm Airlines (QB, Tehran Mehrabad). Livery on leased aircraft only slightly modified from existing Qeshm markings. Prior to bankruptcy in December 2006, Taftan Air had operated its own fleet of Fokker 50 aircraft on flights throughout Iran. Current operational aircraft now include EP-FQA (cn 20274), EP-FQB (cn 20263)..EP-FQC (cn 20275) and EP-FQD (cn 20265). Aircraft remaining in storage presumed to include EP-TFN (cn 20302) and EP-TFT (cn 20298).